The Old Town Triangle Association (OTTA) was established in 1948 as a nonprofit neighborhood organization to aid in the development of recreation, crime control, schools and other social service programs for residents who live and work in the area bounded by North Avenue, Clark Street and the former Ogden Avenue. Members pledged to preserve the architectural integrity of buildings in the Triangle, to improve open spaces and green areas, and to support cultural, educational, and recreational activities that would improve community life. 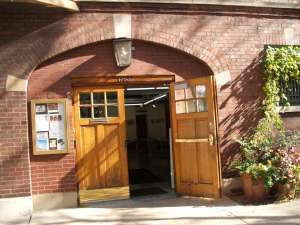 The Old Town Art Center was founded in 1956 to promote art study and appreciation in the neighborhood. The Art School provides a friendly, low-key learning environment for both, professional and non-professional, artists. The Triangle Gallery displays the work of prominent local artists and holds a formal opening for each new show (approximately 10 per year). The current home of the Old Town Triangle Association is a landmarked building at 1763 N. North Park Avenue. Constructed in 1915 as a garage with servants’ quarters for wealthy Chicagoans living on the Gold Coast, the building is now a venue for social interaction and cultural activities, focusing on the arts.